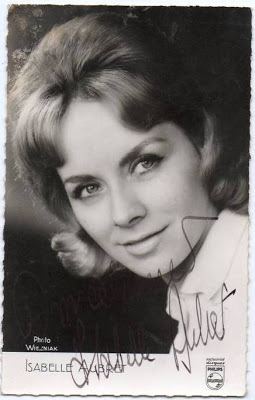 Isabelle Aubret (born 27 July 1938) is a French singer. She permanently pays tribute to the greatest artists and her repertoire is worth the best anthologies of classic French music. A promising gymnast as a child, she won the French national championships in 1952 but, by her late teens, she had turned her attention to singing. Discovered by the music director of a local radio station, she was recruited as featured vocalist to a Le Havre orchestra and, in 1960, she won a singing competition at the Paris Olympia. There she came under the wing of the hall's director, Bruno Coquatrix, who secured her a cabaret spot in the Pigalle. 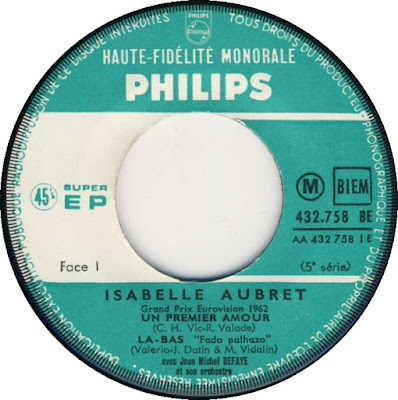 Aubret released her debut single in 1961, "Nous les Amoureux" -- the following year, French vocalist Jean-Claude Pascal would win the Eurovision Song Contest (for Luxembourg) with the same song. Aubret herself entered France's domestic Eurovision qualifiers for the first time that same year, when she finished second. The following year, however, her performance of "Un Premier Amour" was victorious, both nationally and on the international stage. 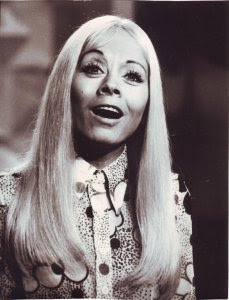 A tour with singer Jean Ferrat (who wrote her hit "Deux Enfants au Soliel") brought Aubret further attention, as did several high-profile shows with Sacha Distel. She was also support act at Jacques Brel's legendary Olympia shows in March 1963; her career came to a shattering halt, however, when she was involved in a serious car accident. She would be laid up for much of the next three years, but both Ferrat and Brel ensured she would not be forgotten. Ferrat wrote her a new song, "C'Est Beau la Vie," which she recorded despite being totally incapacitated at the time, while Brel gifted her with the lifetime rights to one of her favorite songs of his, "La Fanette." In 1965, still convalescing, Aubret made a heroic return to the stage, opening for Salvatore Adamo at the Olympia, but it was 1968 before she was truly back in action, when she returned to Eurovision and finished in third place with "La Source." 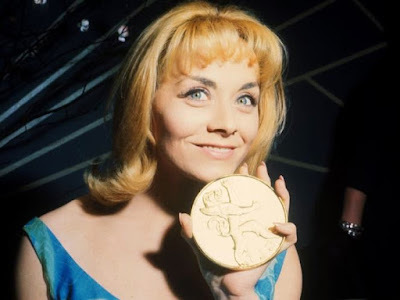 She toured throughout the remainder of the 1960s and, in 1970, she returned to the domestic Eurovision qualifiers when she performed a duet with Daniel Bératta on the runner-up "Olivier Olivia." But she was clearly on her way down in the public eye, a victim of both changing musical tastes and her own avowedly left-wing politics. Singles "The Partisan" and "Casa Forte" were scarcely promoted, and she was all but blackballed from national TV. A new album in 1973, Le Soleil Est dans une Orange, marked the beginning of her rehabilitation, and in 1976 she was back in the Eurovision qualifiers, performing "Je Te Connais Déjà." Four years later, Japanese fans voted her the World's Best Singer, while her albums Berceuse pour une Femme (1977) and Une Vie (1979) were both major successes. Tragedy struck again in 1981 when Aubret broke both legs while rehearsing a trapeze act with boxer Jean-Claude Bouttier. Although she continued recording sporadically, and even returned to Eurovision one last time, performing "France France" in the 1983 qualifying contest, it would be 1984 before she released another album, Le Monde Chante, and 1986 before she could return to the road. This period also saw the release of the compilation Isabelle Aubret Chante Jacques Brel. Her political past was forgotten now, and French media finally embraced her. Released in 1985, the single "1789" was a success, while the album Vague à l'Homme was universally praised for its patronage of rising songwriters Romain Didier, Danielle Messia, and Allain Leprest. The latter also opened for her when she appeared at the Olympia in 1987 for her first Paris shows since the early '70s. She marked the bicentenary of the French revolution with the album 1989, while the 1990s opened with another acclaimed long-player, a collection of English-language jazz standards, In Love. This was followed by what many regard as her finest album yet, a 1992 collection devoted to the work of French poet Louis Aragon. Another release that same year, Coup de Coeur, brought together Aubret's interpretations of some of her favorite French songwriters -- Brel and Ferrat, of course, but also Serge Gainsbourg, Francis Cabrel, Charles Trenet, Jean-Jacques Goldman, Henri Salvador, and Guy Béart. And she crowned the year by accepting the Légion d'Honneur award from French president Mitterrand.